Remarks by Angel Gurría, OECD Secretary-General, delivered at the launch of the report on Better Policies for Colombia as part of the visit by the President of Colombia, Juan Manuel Santos, to France. 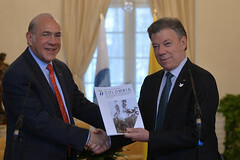 It has been my great honour to present President Santos with our report Colombia: Policy Priorities for Inclusive Development, part of our “Better Policies” series to promote more resilient, more inclusive and more sustainable growth. The report supplements the Economic Survey of Colombia that we presented in Bogotá on 19 January, reflecting the close co-operation between the OECD and the Colombian Government in designing the National Development Plan 2014-2018, which seeks to bring about a Colombia where there is peace, greater equity and better education. Since assuming office in 2010, President Santos has launched a series of ambitious reforms to guide Colombia towards a new era of growth coupled with well-being for the majority, while resolutely promoting Colombia’s incorporation into the OECD. It gives me great pleasure to report that Colombia has made substantial progress in this process, taking an active role in the exhaustive sectoral review conducted by 23 of our Committees. Those achievements should not be grounds for complacency, however. Colombia continues to face very significant challenges as it strives to achieve inclusive growth. And the OECD stands ready to help identify and address those challenges. More effective governance to help strengthen people’s trust in public institutions. Mr. President: We hope this document will prove useful to you. We are very excited to be working with you and your government in designing and launching new reforms – such as the fiscal reforms – that will play a role in the successful implementation of the National Development Plan. Colombia and its people can rely on the support of the OECD in designing, formulating and implementing better policies for better lives. [i] Source: Official data (Central Bank of Colombia). Figure for 2014, consensus estimate by Consensus Inc., report of 19 January 2015 (4.8% for Colombia). [ii] Source: National Statistical Office (DANE), monetary poverty calculated based on the monetary value of a basket of goods and services to cover a person’s basic needs (39% in June 2009 and 29.3% in June 2014).